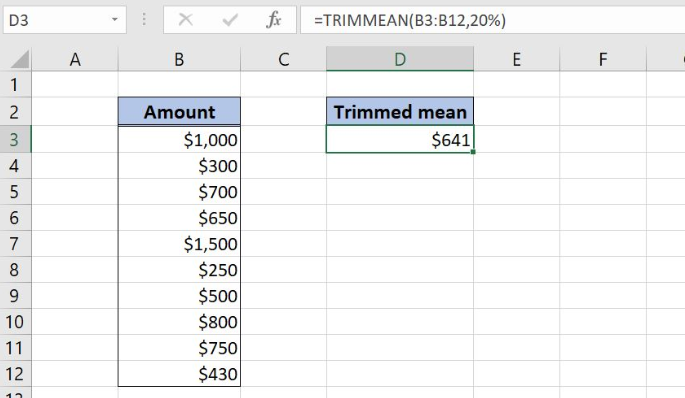 Excel allows us to calculate a trimmed mean for a list of values, using the TRIMMEAN function. A trimmed mean is the average of values, excluding a certain number of highest and lowest values. This step by step tutorial will assist all levels of Excel users in finding trimmed mean for a list of values. percent – a percentage of values that we want to exclude from the calculation. Half of them is excluded from the top and another half from the bottom. 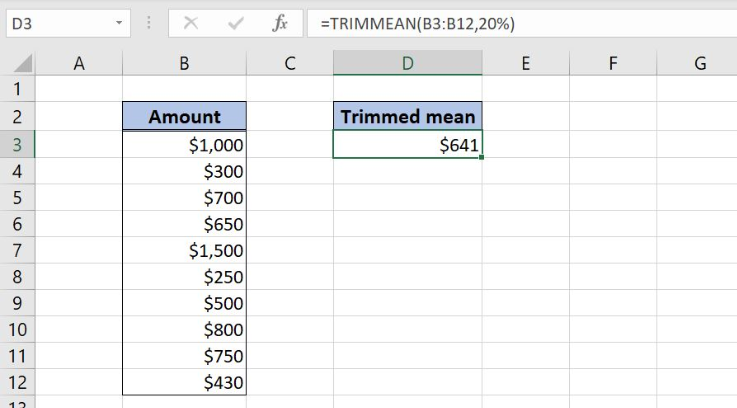 In column B (“Amount”), we have the list of values for which we want to find the trimmed mean. In the cell D3, we want to get the result of the function. In the cell D3, we want to get the trimmed mean for the range B3:B12. We exclude 20% of the values. The array is B3:B12, while the percent is 20%. As we can see, there are 10 values in column B and we want to exclude 20% of them, which is 2. This means that the function will exclude one value from the top ($1,500) and one value from the bottom ($250). The trimmed mean for the list in the cell D3 in $641.